Southwestern Theme Address Plaque - - with a cactus silhouette. Arch shape sign personalized with your address. Made in USA. Wall mount. 16"W x 11.75"H custom sign with a one-line or two-line address. Sturdy, UV-stabilized laminated acrylic plastic construction with engraved wording, cactus accent, and border. Note: the style number (CASW161175) visible in the lower left on the sample signs is for internal use only and is not on your personalized sign. Two color combinations: black with white characters or white with black characters. 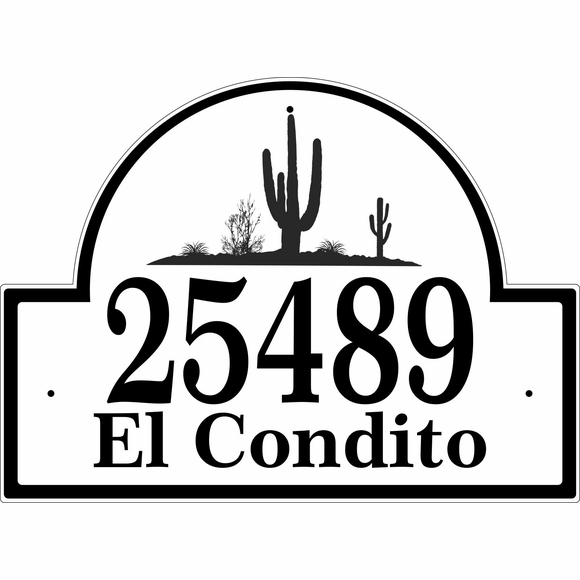 Large arch shape Southwestern Theme Address Plaque features a cactus silhouette above your address.